“Cotswold Gardens is an island of tranquility” exclaimed one of our guests as she entered the garden of our Guesthouse. This heartfelt comment was and still is particularly apt as the garden was in full bloom with Jacarandas, Strelitzia, Dianthuses, Roses, Fuchsias and the large shimmering swimming pool. She was also pleasantly surprised that such an abundance of natural beauty could be so close to motorways and key Johannesburg Attractions of a major city. Many of our guests have also remarked on the large amount of original graphic art on our walls and sculptures around the garden. Sometimes we wonder if we are a guest house with an art gallery or an art gallery with a guest house. Nevertheless we believe this creativity gives us an exciting point of difference whilst adding value to our guest's experience. 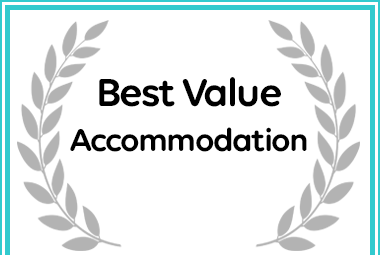 received a Best Value Award for Accommodation in Johannesburg.